Should feel at home among the vampires. Ok, it's just a joke. Having worked as a volunteer in New Orleans' Lower Ninth Ward, I am thrilled that Brad Pitt is continuing his efforts to literally "make it right" down there. Despite the fact that I appreciate his efforts there, however, I really can't stand how stars are coming out en masse with all of their varying causes NOW. To me, it's frustrating because all of these causes could have been helped by them for the last couple of years, but they wouldnt work with DC because they didn't approve of the president. Now that they do, they care about causes enough to be seen on Capitol Hill. What happens to these people and these causes if Hollywood doesn't agree with the next president? Particularly irritating to me is Tobey Maguire, Demi Moore and Ashton Kutcher and their community service soapbox. Some of us were doing it all along, whether we agreed with the politics in DC or not. Now is not the time for pontificating, its a time to get out and do something. Proud American: SPADED? They do have dictionaries online. I have nothing but praise for the good that Brad and Angelina have done. There always has to be people that are jealous of others because they can't be half the person they are complaining about. I have a question for Brad, How are you greening up the houses? The homes are LEED certified for building materials that both cause minimal environmental impact, are make from recycled material, and give off no volatile organic compounds. The homes are oriented for and installed with solar panels to provide energy that doesn't come from the local electrical grid. The houses are raised up above the worst of the flood plane for the next inevitable hurricane. Is Gov. Jingl fixing the levi correctly now? No, they're still vulnerable. Was that part of the Gov. Stimulus proposal? No, it's Pitt's private money. Was it part of his pork money? No. As someone who spent a year with AmeriCorps doing Gulf Coast recovery work and other community service around the country during the Bush years, it is frustrating for me to see celebrities coming out en masse pontificating about the importance of service. Where were they the past eight years? To me, it looks like they're only willing to work with DC and back causes as long as they approve of who is filling the chair in the Oval Office. It totally escapes me as to what makes Brad Pitt so irresistible to so many adoring people and all those gigling fans. Brad, marry your girlfriend and be a real role model as the father in a family. As someone else said, for all the haters posting here, How many of have actually done anything to help in New Orleans?? Have you ever been to New Orleans, and if so, how of you actually visited the 9th ward? Stop complaining and help your fellow citizens or better yet, leave the country if all you want to do is complain. The American media veiled the devastation as much as they could the terrible human death toll and devastation after Katrina. International media sources offered much more in depth coverage of the disaster. President Bush and the Republicans really turned their backs on those who suffered and died in New Orleans. The lives of poor minorities don't matter to the GOP. It was sad lasting image. Brad should be commended for his work.....Nancy Pelosi should be ashamed of herself for that crazy Democratic Pork spending when people in New Orleans have been struggling for several years. She is bankrupting our country and there will be no money to help with the relief effort if she is not kicked out of office soon. Calling Angelina Jolie his "girlfriend" is inappropriate. They are raising 6 children. In Canada, we have a better word: "partner". I don't understand why you don't use it much in the U.S. It works for married or co-habitating, gay or straight couples. Dang...between Pres. Obama and Brad Pitt, the White House has NEVER had that much fine in it in one day. How come no one ever tells me about the idiot Nancy Pelosi. Someone needs to get rid of her and start our goverment over again with minds. If you want to be a congressman/woman or senator you need to be active and away from lobbyists. Maybe the start ought to be with getting rid of Wall Street and GM and put those monies toward our kids and their education. Futures need to be gone also. I do not see so much happening with the stimulus with Obama. I still will give him time because he cannot do any worse then Bush. I agree with KC, she is fulll of it and needs to be taken out of the picture. Actors need to stay out of the picture. They also make too much monies. Why don't these people adopt American kids? I feel sorry for kids all over the world and give monies here and there but we have a lot of starving kids here and need love also. Oh I forgot, stars have the monies and believe going overseas with their champaign and everything else makes them a better person. Even when a person tries to do something good people will find something to complain about. I guess this is America. Why doesn't Nobama spend his free time reading the stimulus bill he signed without reading instead of hanging with the reconstruction expert that Brad Pitt has become by acting in "Fight Club". 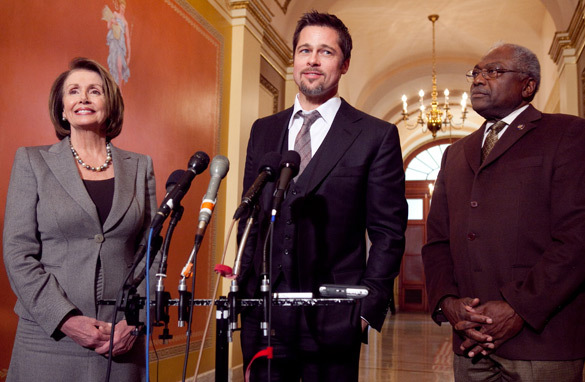 Actually, Brad Pitt is more experienced than Nobama – he can act out his "script" without a teleprompter. I'm glad to see BHO is spending his days getting advice from the Movie Stars who campaigned for him, while he ignores the falling stock market created by his policies that are destroying the savings of most Americans. I'd have more respect for Pitt's contribution to environmental factors if he didn't pollute so much by globe trotting around in private jets. Wow, doesn't get more shallow and stupid than this. Just another example of how easily americans are seduced by celebrity. Is pitt a good actor? Yes. Does his opinion mean anything more than mine or your own? No. But he certainly wants to capitalize on others suffering to increase his stature in the world (a billionaire building a few "sustainable" homes and then proclaiming, and promoting himself in the process, some type of radical breakthrough is anything but -sounds a lot like our self absorbed celebrity potus). Anyone who can't see through this insincerity probably didn't see through Obama's silky smooth (not to mention annoyingly condescending) but ultimately meaningless and empty rhetoric.